There are certain things that a prospective passenger should expect a passenger train operator to be able to do, even if they offer a bare-bones service on a very limited schedule and only accept cash payment. If the operator allows reservations to be made by phone, one expects the reservation to be honored and to guarantee a seat, or at least a place to stand, on the train. 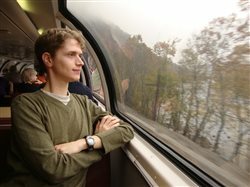 Well, two travel companions and I have encountered one passenger train in North America that doesn’t even meet that basic expectation. 10:30 AM Kaoham Shuttle to Seton Portage boarding at the BC Rail depot in Lillooet on Sept. 1. Photos by Malcolm Kenton. Prior to 2002, BC Rail (owned by the Province of British Columbia) operated a regularly-scheduled passenger service, equipped by Budd RDCs, over the 466 miles between North Vancouver and Prince George, BC. The railroad also allowed its RDCs to be chartered for passenger excursions over various branches of its line, covering many sections of the province’s rugged interior (I’m sad to have missed the opportunity to travel on these). Two years after the end of passenger service, BC Rail was leased to Canadian National (whose transcontinental network the BC Rail line connects with at Prince George) and now sees only light, local freight traffic. However, it is still possible to ride a tiny 18.8-mile piece of BC Rail trackage as a paying passenger on a regularly-scheduled run — at least in theory. Since 2002, the Seton Lake Band of the St’at’imc First Nation, the area’s indigenous residents, has paid Canadian National to run trains consisting of one or two rattling, sparsely-appointed railbuses on published schedules over what’s now its Squamish Subdivision between Lillooet (a small town about a third of the way from North Vancouver to Prince George at milepost 157 on the main line) and the even smaller community of Seton Portage, along the north shore of Seton Lake, with one intermediate stop at Shalath. Service is also available by advance appointment farther west to D’Arcy. The territory is so challenging on this stretch that the railroad remains a superior alternative to the treacherous unpaved road that serves as the only other land route between the two locales, but goes 44.7 miles around the other side of the mountain from the lake, making the rail route 25 miles shorter. This bare-bones passenger service is known as the Kaoham Shuttle. The service’s main purpose is to give the isolated residents of Seton Portage and Shalalth, mostly members of the First Nations community, a way to access their nearest schools, banks, grocery stores and medical center in Lillooet. As such, the railbus generally only operates into Lillooet in the morning and back to Seton Portage in the evening, requiring anyone wanting to travel the other way to stay overnight in a tiny village with few guest accommodations. However, the railbus does make one weekly run that is more convenient for tourists and seems geared towards such use — departing Lillooet at 10:30 AM on Fridays and returning at 2:30 PM. But if you, as a tourist, make the lengthy drive to Lillooet on BC Highway 99 and arrive at appointed hour expecting to be able to buy a ticket and ride, prepare to be disappointed. 2-car Kaoham Shuttle consist at Lillooet, BC on Sept. 1. Reservations and ticketing for the Shuttle are handled entirely by two representatives of the Seton Lake Band. CN, which provides two-man crews to operate the railbuses, has no role in customer interaction. And as my two travel companions and I discovered when we attempted to ride on Sept. 1, our reservations were made in vain. After spending the previous night 105 miles east in Kamloops, we arrived at the Lillooet depot (which still bears a BC Rail sign in front) at 9:45 AM that Friday. We found the small waiting area locked up and five people sitting on benches in the shade beside it. We were informed that when the train arrived from Seton Portage, the crew would unlock the waiting area for about 10 minutes and lock it up again before departing. As we stood around talking with the waiting group, a van bearing the name of a local shuttle company pulled up and disgorged a gaggle of maybe 20 Japanese tourists who all filed onto the platform, taking photos with their phones, using selfie sticks and chattering away in Japanese. The train appeared across the yard at 10:30 and reversed, after the conductor threw two switches, onto the platform track. After the crew members lowered the steps on both cars and unloaded maybe four or five passengers, they retracted the steps while they went to unlock the waiting area. Several who were waiting went inside, but my friends and I stayed on the platform while the Japanese tourists congregated around each boarding door. It was not made clear who was checking reservations and taking payment. Railbus used for the Kaoham Shuttle with boarding steps deployed at Lillooet, BC on Sept. 1. Shortly, the crew returned to the train and opened the doors for boarding and the Japanese hustled aboard and grabbed seats. It then became apparent that a short, soft-voiced woman with a clipboard, a representative of the Seton Lake Band was checking reservations and taking payment (cash fare of $10 CAD round-trip). By the time she was able to check our names off her list and take our payment, all of the 20 seats on each car had been taken. The crew would not allow standees. Our names had been the first three on the list, but the woman with the clipboard refused to ask anyone who had boarded ahead of us to vacate the seats they had claimed. There were five other would-be passengers in the same predicament, all complaining vociferously to the woman, who offered no remedy except to give us our cash back and advise us to call the Band office to complain, as the CN crew rushed her to board as the train needed to be on its way. Like many who had attempted this ride before us (as we discovered by reading online accounts that also spoke of having to compete with pushy tour groups), we were out of luck. There was no later train, other than a late afternoon departure requiring an overnight stay in Seton Portage. Had I known how the operation worked, I would have pushed myself on board immediately, saved three seats and let the formalities sort themselves out. This, truly, is no way to run a train that at least ostensibly caters to visitors. While I am willing to cut the Seton Lake Band some slack as it is not primarily in the railroad or tourism business (and given the historical experience of indigenous North Americans), the Band members who manage the train service should be savvy enough to handle a reservation system properly, and to take measures to control the boarding process and check reservations before passengers are allowed to board. The Japanese group was able to take advantage of a dysfunctional system, most likely because their tour operator knew the ropes and advised them what to do. As much as the interesting and scenic mileage covered by the Kaoham Shuttle appeals to us, given my experience, my friends and I doubt that we will return to Lillooet to attempt the trip again unless we hear that management has improved.